I’ve written about earth friendly paints here on Eco Child’s Play before. With a recent home improvement project (that feels like it will last forever), I’ve had paint on the mind. 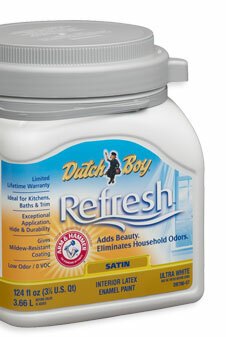 Now, Dutch Boy has introduced a line of paint called Refresh. This zero VOC (volatile organic compounds) paint is Greenguard Indoor Air Quality Certified. Another awesome bonus… this paint actually eliminates odors around the house. I can definitely take advantage of this benefit to help reduce the smoke odor in our home from the previous owners. I’m wondering if I could use 50 gallons of paint? I suppose if I did the exterior if our house as well… or shared the paint love with friends and family. You can also win paint by voting on the ugliest-stinkiest room. Four winners will be selected each month for 6 months. Each will receive four gallons of Refresh paint in their choice of color and sheen. IMO, four gallons would rock, that’s just enough to paint my kitchen… which is one of the million projects which haven’t been finished yet. Since I’m pregnant and have young children in the house, I’ve been looking for an ideal no VOC paint. The one issue I’ve found is several “green” paints, including Dutch Boy have no VOCs in the base paint, but there ARE VOCs in the colorant which has to be added, so it really isn’t no VOC (it says that on their site). It’s to obad since the odor absorber aspect sounds so great. We’ll probably end up using Benjamin Moore’s Natura which clearly says on their website that it is no VOC regardless of color (as is Home Depot’s Freshaire). Just thought I’d share what I’ve found. 55 yr old man, who works very hard to just make ends meet, living in a trailer house with another friend….Then home has very poor carpet, cabinets, countertops, just everything. I am poor, and do need help in trying to make my home livable. Okay, now the last of my children have gone off to collage and I am looking at his bedroom walls he “decorated” himself…..oh my! One green wall, paint peeling. Another two walls proudly painted purple for his high school colors! The fourth wall? Well I can’t even describe the color. Mmmmhmmm…HELP! I could absolutely use some paint. A new empty nester in Montana with a plan!